It all started, as these things usually do, with a phone call from an old friend. In this case, the old friend was Doug Fairfield, a sailing companion from the early 1990’s in East London. Doug is now cruising in the Southern Caribbean with his wife Val on their St Francis 44. The gist of the conversation was that Doug’s son Dylan, daughter Kate and her partner, Jason, had a contract to deliver a Fontaine Pajot 44 Helia to Tortola in the Virgin Islands where Jason and Kate would be running the boat in a charter operation for the Russian owner and they would like someone with experience to ‘ride shotgun’ for the delivery trip through the Mediterranean and across the Atlantic. “Would I be interested?”. Of course I was. The obvious questions were “where is the boat now and where would the delivery start?” and “when does this happen?” This seemingly ordinary question was anything but that. There were several considerations to be taken into account. The first was that the delivery crew were all South African passport holders with implications for visas and the length of time needed to apply for them and the second was that the boat needed to be in Tortola by 4 November in order to participate in a Charter Boat Show! We established that the only country bordering the Mediterranean Sea that does not require South Africans to have visas is Tunisia! The boat is registered and based in Bar, Montenegro. For us to have travelled to Montenegro to collect the boat would have meant applying for visas to visit Montenegro via the Serbian Embassy in Pretoria! This introduced way too many unknowns into the equation and the owner of the boat came up with a plan to use a Russian skipper to move it to Tabarka in Tunisia for us so that we could start the delivery from there. This solution sounded remarkably elegant but no one thought to consult the weather. Constantin, the delivery skipper from Bar to Tabarka had a rough time of things, aside from being a single hander. The prevailing winds forced him to hug the Albanian coast on a south easterly heading, all the way to southern Greece before he could tack and head for Malta and then Tunisia. Facing further, westerly headwinds from northern Tunisia, he was obliged to turn into Bizerte to refuel. It must have been an interesting encounter with the Tunisian authorities as Constantin speaks virtually no English and the Officials spoke no Russian! This resulted in a small oversight which was to have unpleasant ramifications for us, the new crew, a few days later. He neglected to clear in with Customs at his port of entry. In the mean time, Jason, Kate and I had flown from Cape Town to Tunis, via Dubai and Dylan flew from New York, via Istanbul. We all met in Tunis. All of us that is except for one essential piece of luggage. And it was a weekend, following a major religious holiday and no one seemed particularly interested in our plight! We proceeded by minibus to Tabarka, a three hour journey through really beautiful countryside. My best description would be that it was a cross between Klein Karoo and Swartland vegetation with massive olive groves and herds of sheep. 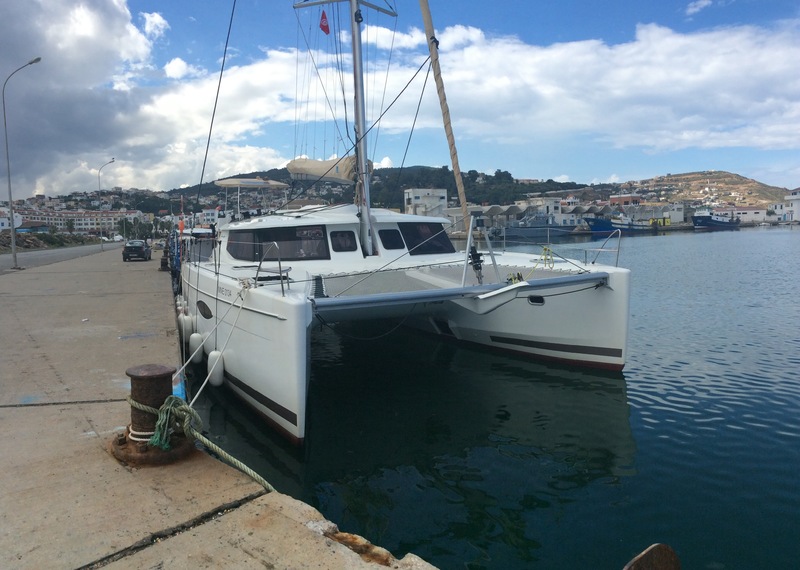 We arrived in Tabarka in the late afternoon to find that our boat was still a day or more away from port! The owner was in Tabarka to facilitate the handover and he booked us into a newly built hotel in the port area of Tabarka. We just managed to find a television that was covering the Rugby World Cup, in French, and watched the last half of the SA vs Samoa match. 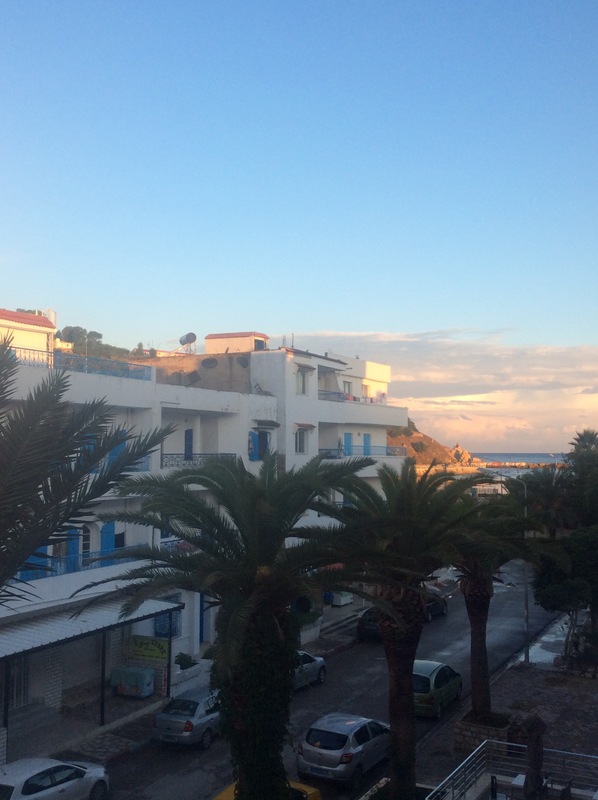 Tabarka is a small resort town close to the Algerian border and the signs of the impact that both the economic crisis in Europe and the recent political instability have had were everywhere. New buildings were in various stages of completion but all work had ceased. Incidents in resort areas where foreign tourists had been shot had clearly affected the tourist trade upon which the country is almost entirely dependent. Existing Tourist facilities were falling into disrepair and the whole town had an air of dilapidation. There seemed to be many unemployed men sitting in groups throughout the town. Constantin arrived in Tabarka late the following evening and we immediately moved aboard to save on hotel costs. After the obligatory celebration of his arrival, and a very late evening having the finer points of Russian rock music and Montenegran wine explained to us in detail, we collapsed into a deep sleep in our new home. A visit by the Port Captain the next morning made everything legal, or so we thought. When I asked him where I could dispose of our rubbish bags, I thought he was going above and beyond his duty when he said “No problem, give it to me” and then promptly tossed the bag into the boulders making up the breakwater! Electing to have an early night as a taxi was arranged for 04h00 the next morning for the trip to Tunis to find the errant luggage, we were all either asleep or preparing to go to bed at 20h30 when we were roused by a heavy booted presence in the cockpit. Two young Customs officials armed and in full combat gear boarded and advised us that they were here to check the boat. 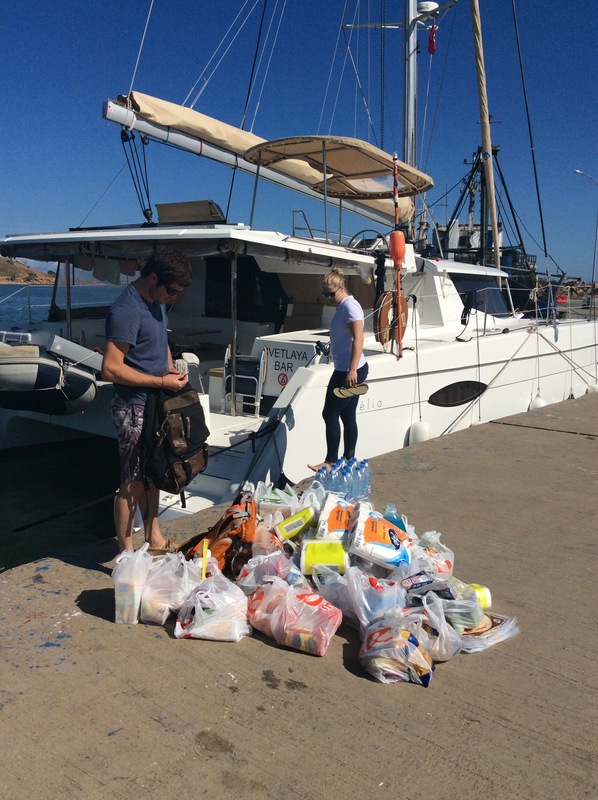 We explained that the vessel had cleared in at Bizerte the previous day but they weren’t interested, especially as Constantin couldn’t produce a Customs clearance form and proceeded to make us fill in forms declaring what we had on board. The form, in French and Arabic, had a small block where we were advised to fill in “like Mobile”. We all duly declared that we had mobile phones and in my case, an iPad and a satellite phone. We were asked whether we had any spirits, drugs or weapons and it dawned on me that we knew nothing about Constatin, the delivery skipper, who was still on board with us. He could possibly have a stash of illicit or prohibited goods and we were all now squarely implicated. Then they started searching cabin by cabin and confiscated anything they felt like confiscating apparently at random. Top of their list was cameras and U.S. dollars which were “prohibited”! Clearly this was affirmative shopping at its best and we were outraged which didn’t improve the atmosphere on board. Thinly veiled threats were made about arrest and detention. When these goons were ransacking my cabin and had decided that my camera was not worth prohibiting, the main protagonist received a phone call from his boss. I understood enough of the Arabic to know he was being asked to explain what he was up to and his expression went from gleeful re telling, to irritation and then defensive aggression. Clearly his sortie had not been authorized by his senior! His boss duly arrived by car, very quickly and the goon’s demeanor changed rapidly. I had an earnest discussion with the boss man in rudimentary Arabic and schoolboy French, remaining as polite and calm as I could, as to show anger in Arabic culture is a sure way to lose face and therefore any moral high ground. We agreed that the Customs official had exceeded his mandate and undertook to consult with the boss if we were in anyway uncertain as to what the regulations were, as we had no intention to offend or do anything illegal as we were just “desperately needed tourists” supporting their economy. The goons were chastised and left, but not before annexing a bottle of Jaegermeister they found in Constantin’s cabin, just to save face. Haram. We were all well shaken up and realized that in the excitement of meeting and taking over from the previous skipper, we were very naïve in not checking that the vessel was all legal and legitimately in the country. This could have gone horribly wrong for us, especially if the previous skipper had decided to smuggle drugs, weapons or other contraband. A lesson learnt. Eventually, around 22h30, we all returned to bed, quite shaken by the experience. The next incident was less than two hours later! Tunisians do not share the commonly accepted principles of privacy and private ownership of property. Combine this with a culture that encourages carousing until the early hours of the morning and celebrates the taking of photographs with exotic backdrops, and we had a perfect storm situation for us to believe we were being boarded by disaffected Customs officials bent on taking revenge for their humiliation, when actually it was only groups of citizens on their midnight strolls posing for group photos in our cockpit! The following day was for victualing and for Jason to make the six hour round trip to Tunis to collect our luggage. Constantin went with him to catch a flight to Montenegro. Dylan, Kate and I shopped up a storm in the local supermarket and fresh goods market. Virtually everything was available and at very reasonable prices. We filled up with fuel and water and awaited Jason’s return so we could check out and leave as we were starting to run behind schedule. There was a slightly unfavorable weather forecast but we were happy that if we checked out and then waited for a few hours, we could avoid the worst of it. Checking out with the Port Authorities and the Marine Police was an easy and pleasant experience with the officials friendly and genuinely interested in what brought us to Tunisia, how our national soccer team could improve and where we were headed, and why! The same could not be said for the Customs officials! Surly, unfriendly and aggressive officials made sure we were hindered at every step of the way, and although our passports had been stamped with exit stamps, they confiscated them and tried to pressurize us into, I presume, paying to get them back. Clearly they had not forgotten about the earlier incident. Eventually we managed to up level the situation to the Head of Customs and he very politely re-educated his minions. Again, as a face saving exercise, they came aboard and searched the vessel from top to bottom, refusing to say what they were looking for! After this, fearing some sort of retaliation, we cast off our lines and left just before sunset, preferring the less than perfect weather forecast to another night alongside in Tabarka! 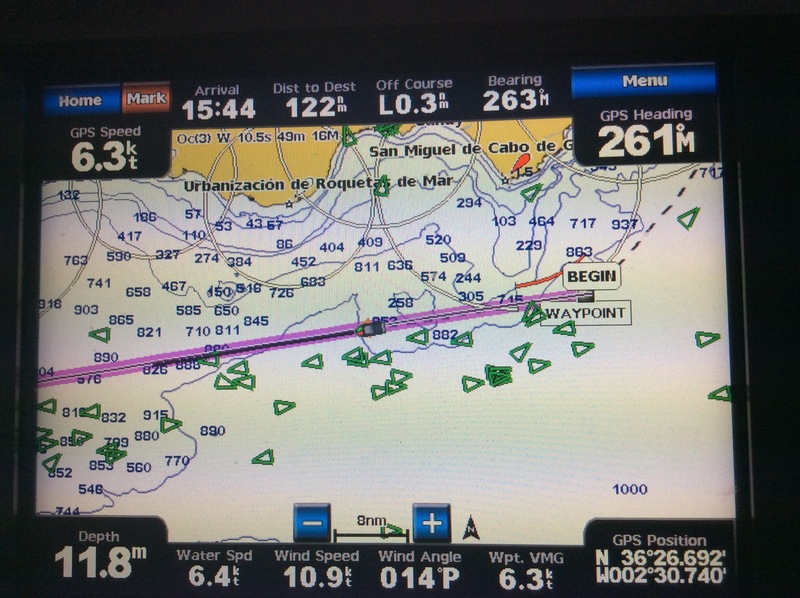 Our route took us almost due north to avoid sailing into Algerian waters and then north west towards the Balearic Islands of Majorca, Menorca and Ibiza to avoid a strong East setting current and westerly wind closer to the African coast (and more tin pot dictator wannabes). Conditions were fresh westerly becoming very strong northerly winds and a typical shallow water sea state with steep swells with a short wave period. The first two days saw us only needing an unfurled genoa to maintain a decent, albeit very uncomfortable, 7 knots. When we turned more west and the wind went into the north and rose to a solid 40 knots, gusting 57 at one stage, we had to become more defensive in strategy. The residual westerly swell combined with the newer northerly swell created a punishing sea state threatening to break even well found boats, the situation exacerbated by the gale force wind. We had an option of running before the conditions, and ending up somewhere between Algeria, Tunisia and Libya or adopting a defensive stance to minimize the impact of wind and wave. Ending up back where we started didn’t seem like an option and having any sort of sail up with a steep beam sea and a gusting wind exposed us to the risk of capsize. We took a decision to motor gently ahead at an approximate 15 degree angle to the main swell in order to prevent the boat from crashing over waves with both hulls simultaneously and at the same time being able to regulate the speed at which we crested the swells. It was a strategy that worked well and we saw off the worst of the weather over the next 24 hours and when things had calmed down we were able to set full sail for the first time and enjoyed two days of decent beam reaching! And some good food! This was followed by two days of very light winds necessitating the use of one and sometimes both engines. All our fuel consumption figures were neatly written out for us, in Russian! What ever story these numbers told, the reality is that we were using fuel faster than expected and we needed to stop and refuel before Gibraltar and the 700 mile leg to the Canary Islands. 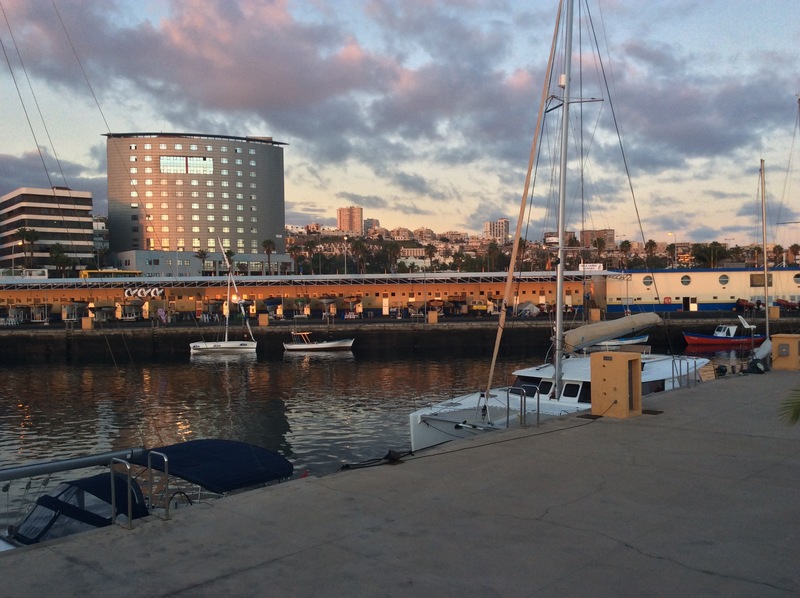 We selected a marina in a coastal town called Benalmadena, near Malaga as being as close as anything to our chosen route and pulled up at their fuel dock mid siesta! Despite this, the staff couldn’t have been more welcoming and accommodating. 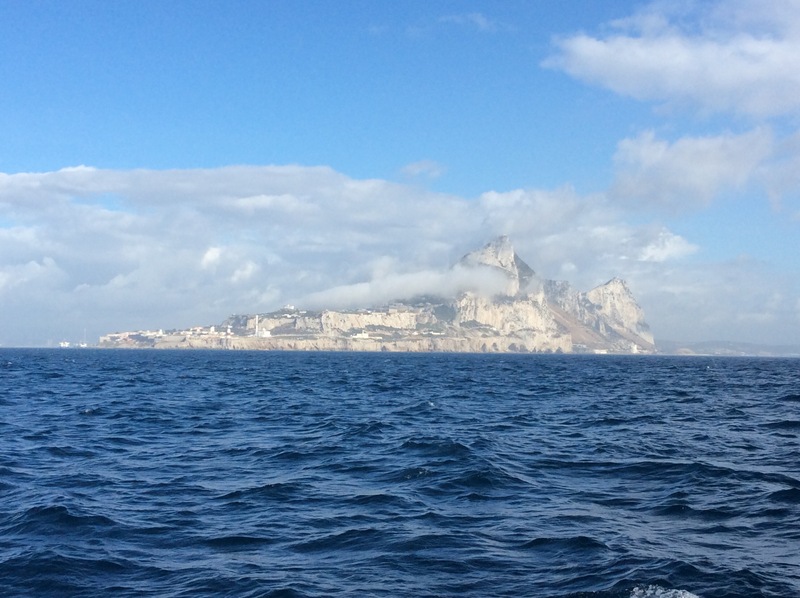 We took on fuel and water, took a few steps in Spain and left again, motoring slowly for the Straits of Gibraltar timing our arrival there for just after high water the next morning. It’s quite a busy stretch of water and various maritime authorities take their custodianship of this stretch of water very seriously. We were stopped, politely but firmly, by three different agencies wanting to know the number of crew, nationalities and port of registry of the vessel. This certainly as a result of the current refugee/migrant crisis facing Europe. While lining up for the Straits, we heard an All Ships Alert concerning a “rubber boat with 32 passengers taking on water” a few miles on the Moroccan side of the middle point. Having seen what the Mediterranean Sea is capable of when it gets angry, I am seeing the desperation of those people in a new light! Trying to do the right thing and obeying all the Traffic Separation Scheme regulations, we watched in amusement as (mainly French flagged) yachts carved their own courses through the high speed ferries and slow moving cargo vessels. Of the five days we took to get to Las Palmas, we managed to sail for two complete days using only the asymmetric spinnaker with the wind around 130 degrees aft. Definitely this type of boat’s preferred angle! We arrived in Las Palmas, Gran Canaria, on a Sunday afternoon, not really expecting much evidence of officialdom, and not being disappointed in this expectation! Tying up to the Reception Dock in the enormous Marina, we made ourselves at home and went on the hunt for fresh food and drink! We intended to refuel, stock up for the balance of the passage to Tortola and obtain sailing and engine spares needed from the well stocked chandleries and then leave as soon as possible. We had no idea that Monday was “Hispanic Day” and a major public holiday! And they take their public holidays very seriously in Spain! So, with an enforced day of leisure, we enjoyed some walking about and some of the hospitality this beautiful city has to offer. We also managed to get laundry done and our food provisioning done at a modern and well stocked supermarket. Buying groceries in a language you don’t understand is always fun! We’re still trying to work out what some of the stuff we bought is, in our efforts to tick off all the items on the list Kate prepared for us. A marina official did turn up on the Monday and placing practicality over administration, he directed us to a smaller Marina and advised that it wouldn’t be necessary to let the Customs and Immigration know that we were here, as we would be leaving the following day anyway! 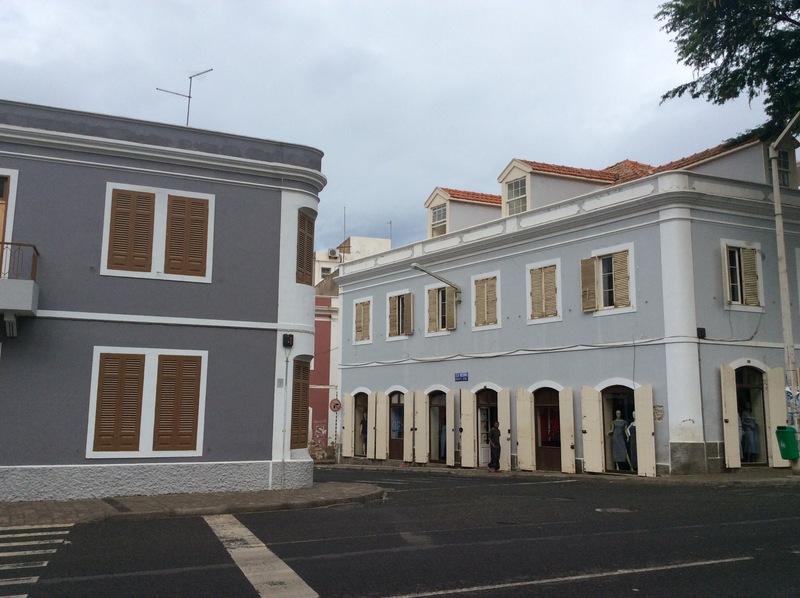 With the spares and fishing gear purchases made early on the Tuesday morning, we fueled up and bade our hosts farewell, bound for Mindelo on the island of Sao Vincente, Cape Verdes. The 892 miles from Las Palmas to Mindelo were mainly done under engine power as the wind stayed out of the north, but a gentle 10 knots giving us almost no apparent wind to work with. We did get the opportunity to test fuel consumption for ourselves at different engine revs and found the sweet spot between speed and economy. We were also able to experiment with different down wind sail combinations in (hopeful) preparation for the trade wind leg coming up! The asymmetric spinnaker set to one side and the genoa lead to a block on a mooring cleat amidships gives about as big an area of sail as one could expect to set and it seems to work well from 8 to 15 knots apparent giving a speed of around 8 knots through the water. 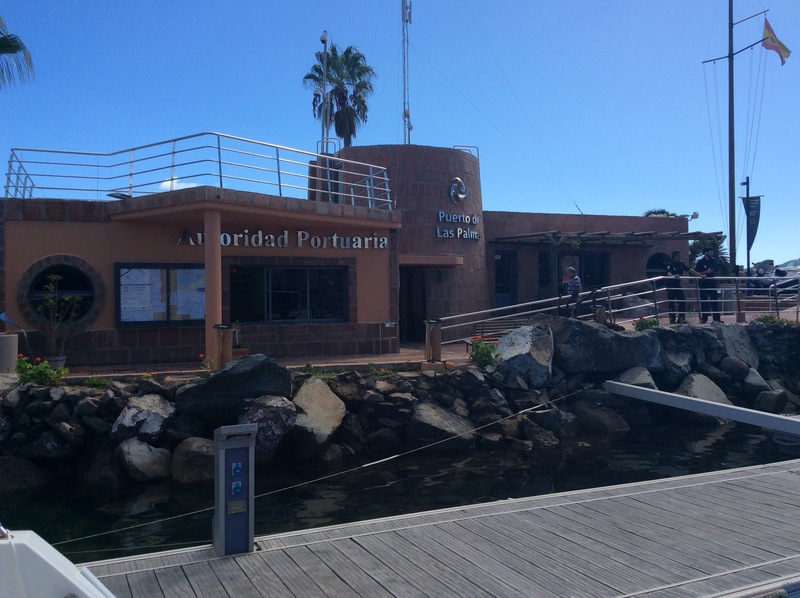 We arrived in Mindelo early on Monday afternoon after a six day passage and were impressed by the welcome of the Staff of the neat, modern Marina. Mooring stern to in the Mediterranean fashion was helped by a marina employee in a dinghy taking our bow lines and passing them through the forward buoys. After two days of reprovisioning and enjoying the hospitality of this friendly island, it’s time to leave and head for what is hopefully a 16 day sail to Tortola in the British Virgin Islands where a charter boat show awaits us.